A Newton Aycliffe steel firm has been awarded a prestigious contract to help build a new £36m entertainment venue in Hull. Family-run Finley Structures has been handed a 960-tonne project to fabricate and erect the steel frame for Hull Venue, on behalf of main contractor Bam Construction. 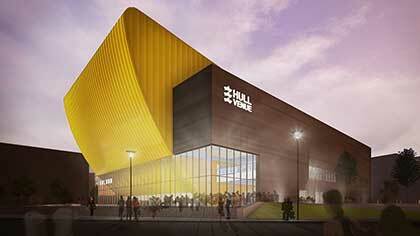 Hull Venue is a state-of-the-art, music and events complex with up to 3,500 seats that will enable the city to attract large corporate conferences, exhibitions and trade tours as well as major touring concerts, stand-up comedy, family shows and sporting events. As well as fabricating and erecting the steel for the multi-use complex, Finley Structures is also installing pre-cast concrete stairs, lift shafts and terrace units as part of the project. The Aycliffe firm is already on site in Hull, while working on another redevelopment project closer to home in Durham city, on the multi-million pound Riverwalk development. “This is another phoenix from the flames type of project,” said Finley Structures operations manager Jim Graham. The Hull Venue contract is one of several major projects won by Finley Structures in the first part of 2017. They also include a 283-tonne project to build a new Hilton Hotel in Lincoln for main contractor Manorcrest, a 300-tonne warehouse in Leicester for A&H Construction and a 614-tonne project for Carillion Construction in Sunderland. The education sector has also been a significant area of growth for Finley Structures in the last 12 months. Recent projects have included Roundhay School in Leeds for Interserve Construction, Ryde Academy on the Isle of Wight for Sir Robert McAlpine, Doncaster Sixth Form College for BAM Construction, George Mitchell School in London for Bowmer and Kirkland, and SEMH School in Seacroft, East Leeds, also for Interserve. Finley Structures has also completed a 337-tonne project for Bowmer and Kirkland, to fabricate and erect Avanti School in Stanmore, London, and has also won a third contract with Interserve for another school, this time the SEMH School in South Leeds, which is already on site. Graham added: “It has already been a hugely positive start to 2017 for Finley Structures which also gives us a strong start to the new financial year from April.